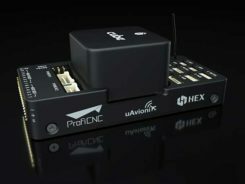 Kinematic Ground Control point for UAV photogrammetry: A dynamic duo of UAV and mobile van combine to deliver the accuracy of conventional methods with only 2+2 ground control points at the ends of the corridor. 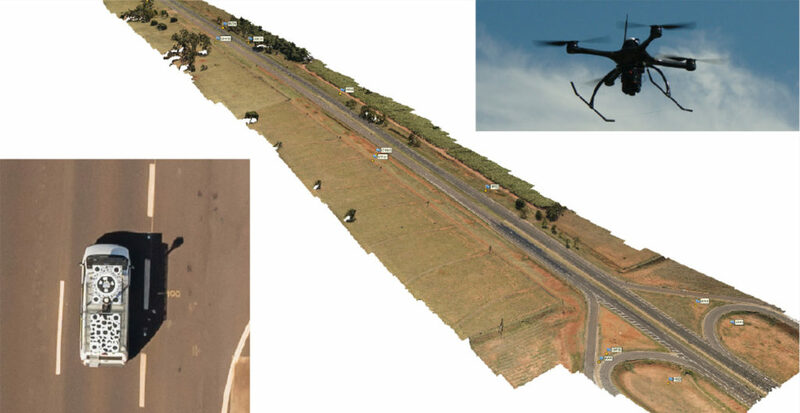 A Brazilian and a Spanish company, ENGEMAP and GeoNumerics respectively, have finalized the accuracy evaluation of a mission conducted with the latter’s mapKITE technology on a Brazilian motorway in 2018. The goal of the evaluation was to confirm the advantages of the mapKITE method and its kinematic ground control point (KGCP) concept over conventional corridor mapping methods. The mapKITE and the conventional method delivered comparable accuracy results — the difference being that the latter requires a dense set of surveyed ground control points (GCPs) while mapKITE does the job with almost no GCPs. as a mapKITE aerial corridor block in a 4 GCP + 14 GChP + 189 KGCP configuration. The conventional method delivered: μEN = 17, μh = 26, σEN = 26, σh = 44 and RMSEN = 32, RMSh = 51. The mapKITE method delivered: μEN = 26, μh =-20, σEN = 22, σh = 48 and RMSEN = 34, RMSh = 52. The mapKITE configuration uses only four GCPs (two at each end of the road segment) in contrast to the 23 GCPs of the conventional method. Nominal flying height of the drone was 120 meters above ground, producing an average ground sampling distance (GSD) of 2.3 cm. Forward image overlap was 80% resulting in a base-to-height ratio of 0.157.
a real-time virtual tether and post-mission software. In a mapKITE mission, the drone follows the land vehicle, and thus the vehicle target becomes a kinematic ground control point visible and measurable on each image. It is a high-accuracy, high-resolution Earth observation method. MapKITE combines the advantages of mobile land-based encompassing images and 3D point clouds. MapKITE combines the advantages of mobile land-based (manned) and aerial drone (unmanned) mapping systems. GeoNumerics (Castelldefels, Spain) is a research and development company specializing in geomatics and accurate navigation. ENGEMAP (Assis, Sao Paolo, Brazil) is one of the largest and oldest mapping companies in Brazil. It has more than 100 employees, three aircraft, two mapping land vehicles, a number of rotary- and fixed-wing drones and a record of accomplished mapping and cadastral projects. ENGEMAP is officially authorized by the Brazilian Ministry of Defence (MD) and the Brazilian Department of Airspace Control (DECEA) to conduct mapKITE commercial flights in Brazil. 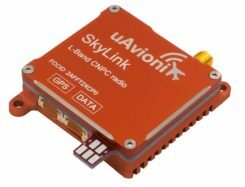 The mapKite campaign was conducted with a Sensormap SMM terrestrial mobile mapping system and a UAVision UX Spyro drone equipped with a NovAtel OEM2 GNSS dual-frequency receiver with a Maxtena antenna and a Sony α7R camera with a 25-mm camera constant lens. The INS/GNSS system in the Terrestrial Vehicle was a Span-CPT (Novatel) including dual-frequency antenna and DMI wheel sensor. ISMAEL COLOMINA is chief executive and chief scientist at GeoNumerics. He has a Ph.D. in mathematics from the University of Barcelona. PERE MOLINA is advanced applications program manager at GeoNumerics. He holds a master’s degree in mathematics from the University of Barcelona and a master’s in photogrammetry and remote sensing from the Institute of Geomatics, Catalonia. ROBERTO DA SILVA RUY is technical manager at ENGEMAP. He has a Ph.D. from the Universidade Estadual Paulista.